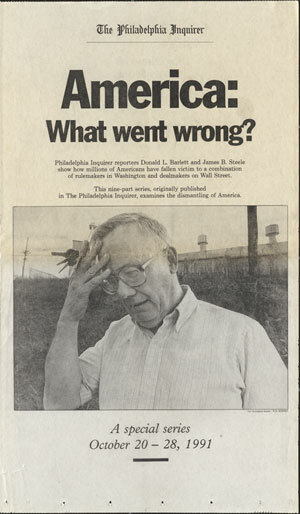 Don Barlett and Jim Steele held a live chat Monday, June 20, 2011 on Philly.com, the website of the Philadelphia Inquirer, read the full transcript here. They fielded questions on the trade deficit, and why Washington is focusing on debt rather than jobs. It was also a great opportunity for people interested in investigative business journalism to ask them questions – they’ve won every major investigative reporting award, except for the one named after them. What Went Wrong's Kat Aaron shares how she has been using social media to find and connect with interview subjects, and intern Vaughn Hillyard explains how more video is being integrated in to the website. Subscribe to the newsletter and stay up-to-date on the latest Workshop news by going here. Are cuts and benefits helping the economy? Kat Aaron examines the changes in programs that struggling people depend on. See our 50-state chart as well as the full article on The American Prospect website.